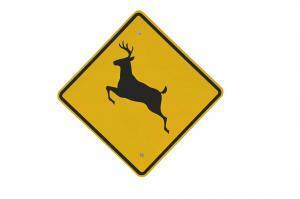 Be Aware of Wildlife and Wildlife Signs: Help Your Fleet Drivers Avoid Collisions. What is the Risk to your Drivers and Equipment? No matter what size your fleets rigs are, deer will run out in front of anything from a small sports car to large tractor- trailers. Deer-Vehicle collisions cause much more damage to small cars; however, they can cause severe damage to tractor-trailers as well. In addition to cab damage it can put the driver and other vehicles in danger also. The size of your tractor-trailers may not protect your drivers. Deer have hit semis in ways that have swung their bodies up through the windshields of cabs. In other cases, truck drivers have swerved to avoid wildlife and have turned over. Wildlife collisions can cause considerable damage to both the truck and trailer and cause lost time and considerable insurance problems. Be Attentive. What are the Warning Signs? Anytime drivers travel through forested areas or travel on smaller highways they need to be continually on the lookout for deer and other animals. Drivers often report that deer and other animals “appeared out of nowhere” while this happens frequently many times there will be warning signs if you are alert to them. For example, highways can be isolated and less traveled built along farm land, rivers, creeks and lakes, areas that are natural habitat for wildlife. Rural Roads are not the only areas of concern, many accidents occur with-in city outskirts also. Remind drivers to use extreme caution around wildlife signs because of the higher wildlife activity. According to the National Highway Traffic Safety Administration, deer-related collisions alone cause millions in damages each year. If your drivers spot wildlife ahead and specifically deer, what can they do to lessen their chances of a collision? Honking your horn may scare deer and domestic animals off, however it most likely will not work on other animals. Drivers should brake quickly but stay in their own lane without swerving. It is always better to hit wildlife head on and avoid swerving into other traffic, off the road or turning over. Drivers should turn on their flashers and carefully pull over. They should use caution getting out of their cab’s, put down flares or reflective safety cones to alert other motorists and call the highway patrol if necessary, to fill out an accident report. Time is money! If your truck is not on the road, you are losing money! If you have been in a wildlife collision, contact Florida Truck & Trailer Co. From minor repairs to major body modifications, turn to our experienced technicians when your truck or fleet needs collision service. We will get you back on the road quickly! Your fleet is a valuable asset, don’t entrust just any collision shop. Contact us today.